Yet rather than fulfilling their natural role of absorbing carbon and balancing the carbon cycle, public lands have become one of the largest sources of U.S. carbon emissions as a result of fossil fuel extraction. In fact, public lands in the continental United States are contributing nearly 4.5 times more carbon to the atmosphere than they are currently able to absorb. The extraction of coal, oil, and natural gas from public lands—and their subsequent combustion in power plants, vehicles, and other energy-consuming activities—is the primary cause of this imbalance. Policymakers have largely overlooked the role of U.S. land and resource management policy in contributing to climate change. President Barack Obama’s “Climate Action Plan,” for example, outlines a set of critical steps his administration will take to address climate change, including reducing pollution from power plants, increasing fuel-efficiency standards in vehicles, expanding renewable energy production, and helping make communities more resilient to extreme weather. With the exception of accelerating large-scale renewable energy projects on federal lands, however, the Climate Action Plan does not take meaningful steps to address carbon pollution that results from U.S. natural resource policy. Though underappreciated, the 700 million acres of land that the U.S. government manages on behalf of the American people occupy an oversized role in U.S. energy and climate policy. Public lands, for example, are “ground zero” for the effects of a warming world: Glaciers are disappearing from Glacier National Park, polar bears are losing their Arctic habitat, and water supplies in the Colorado River are diminishing. Public lands also serve as carbon “sinks,” meaning that forests, grasslands, coastal ecosystems, and other landscapes absorb and store carbon through natural processes. But public lands also affect climate policy in a third significant way: The fossil fuels extracted from them, when burned, contribute high levels of carbon emissions to the atmosphere. Federally managed lands are one of the largest sources of U.S. energy and mineral production, from the oil that is drilled in North Dakota to the coal that is mined in Wyoming’s Powder River Basin. Currently, 42.1 percent of our nation’s coal, 26.2 percent of its oil, and 17.8 percent of its natural gas is extracted each year from public lands and the outer continental shelf, or OCS. In sum, these extracted fossil fuels contribute 23 percent of our nation’s greenhouse gas emissions, according to an analysis conducted by Stratus Consulting and commissioned by The Wilderness Society. Because of the steady and rapid expansion of fossil-fuel production on public lands over many decades, far more carbon is coming out of the ground than our forests and public lands are able to absorb. 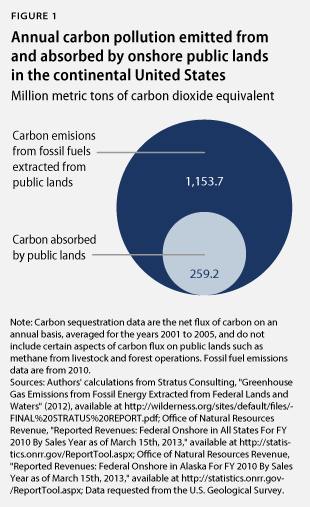 Based on an analysis of publicly available ecosystem carbon-sequestration data accessed from the U.S. Geological Survey, or USGS, public lands in the continental United States absorb 259 million metric tons of carbon dioxide equivalent, or MMTCO2e, every year. Meanwhile, 1,154 MMTCO2e are emitted each year from the combustion of coal, oil, and natural gas extracted from onshore public lands in the continental United States. In other words, nearly 4.5 times more carbon is being emitted from public lands than these places can absorb naturally. All told, we estimate that onshore public lands in the continental United States alone are contributing a net 895 MMTCO2e yearly surplus of carbon to the atmosphere. A few clarifying notes on the data: At this time, the USGS has not yet completed its carbon-sequestration analysis for Alaska and Hawaii, which is why we have restricted our analysis to the continental United States. We recognize, however, that Alaska’s large national forests and other public lands absorb a significant amount of carbon. Additionally, it is worth noting that offshore oil from the federally managed OCS contributes a significant amount of carbon pollution, second only to coal when it comes to fossil fuels from federal lands and waters. However, because the USGS restricted its carbon-sequestration analysis to onshore inland ecosystems, emissions from the combustion of offshore oil and gas are not included in this study. 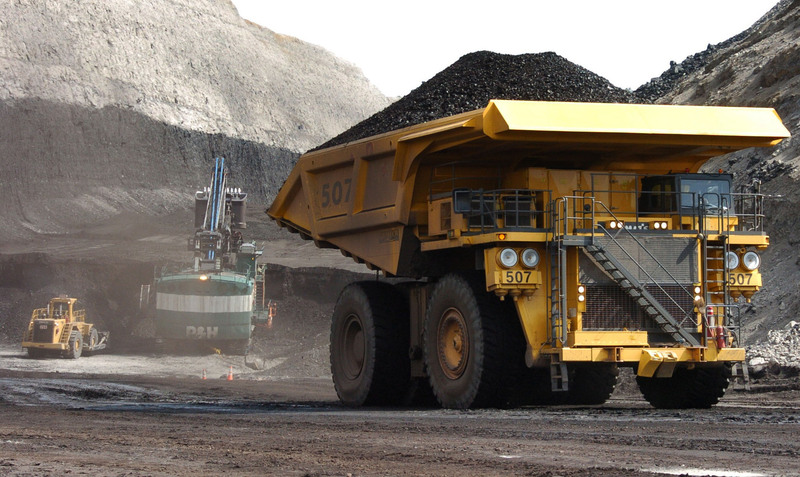 The high rate of carbon pollution resulting from federal natural resource policy presents a challenge for President Obama and his administration. On the one hand, the Climate Action Plan sets a clear goal to “cut carbon pollution in America.” On the other hand, the administration’s “all-of-the-above” energy strategy promotes the expanded production of a wide range of energy sources—conventional and renewable—on public lands and waters, adding to high levels of carbon pollution for the foreseeable future. To begin to reconcile these policy goals and move toward cleaner, lower-emission energy sources, we recommend that the administration establish a carbon-emissions reduction plan for onshore and submerged public lands that helps meet the president’s commitment to reduce U.S. carbon emissions to 17 percent below 2005 levels. To create this carbon reduction plan, President Obama should direct the USGS to work with land-management agencies to develop a baseline of how much carbon is being extracted from federally managed lands and waters each year versus how much is being absorbed and naturally sequestered by our country’s national forests, parks, public lands, coastal areas, and oceans. This baseline should expand on our analysis to include carbon that is emitted and absorbed in Alaska and on the OCS as well as the contributions that renewable energy resources on public lands will make toward offsetting fossil-energy production. Based on the baseline analysis, Secretary of the Interior Sally Jewell and Secretary of Agriculture Tom Vilsack should establish goals for reducing net carbon emissions from public lands over time to meet nationwide carbon-emissions targets. To meet these targets, policymakers will need to both reduce the carbon emissions from the energy resources that are extracted from public lands and enhance the lands’ ability to naturally store carbon. With these two sets of tools—one to reduce the carbon intensity of energy and mineral extraction on public lands and one to preserve and enhance carbon-absorption capabilities of natural systems—land-management agencies will be able to meet annual goals in the carbon reduction plan while also balancing other values and priorities. The many tools available to meet the targets in a carbon-reduction plan would enable land managers to deploy policies that, for example, maximize economic gain, expand recreational opportunities, preserve priceless natural and cultural treasures, improve returns to taxpayers, and enhance energy security. Creating a carbon-emissions reduction plan for public lands is critical to the success of the Climate Action Plan. Without a framework for reducing carbon emissions on public lands, our nation’s natural resource strategy will continue to be guided by ad hoc policies that are internally contradictory and counter to the nation’s climate objectives. In his climate speech at Georgetown University in June, President Obama made clear that tackling climate change will require all hands on deck. “Make no mistake,” he said, “the world still looks to America to lead.” With the administration taking unprecedented action to confront climate change on so many fronts, it is now time to also exert climate leadership on the lands and waters that are our shared heritage. Jessica Goad is the Manager of Research and Outreach for the Public Lands Project at the Center for American Progress. Matt Lee-Ashley is a Senior Fellow at the Center.